Calculating returns for peer to peer lending investments can sometimes be tricky due to the nature of the individual notes that compromise a diversified investment portfolio. For example, if a loan becomes late or charges off, that must be considered in the return calculation. Additionally, since it takes some time to get an account fully-invested, there are effects of idle cash on portfolio returns. To help our clients access a holistic return calculation, the NSR Platform offers two return calculations – one for loan performance and one for cash flows, similar to an internal rate of return. The loan performance calculation accounts for the weighted performance of all notes in your portfolio. This is the metric shown in most areas of the NSR Platform, including the Dashboard, Strategy Builder, and your Account Manager. It’s important to note that this return calculation will be most meaningful with a mature portfolio of loans – usually an average loan age over 18 months. The reason for this is simple – it takes time for loans to establish payment history. If you’re a finance geek like me, you can find out more about the NSR ROI Calculation here. The Modified Dietz Method is the other return calculation shown in the NSR Platform. This calculation method measures historical investment performance based on the external cash flows (deposits and withdrawals) in and out of your portfolio. It’s important to note that the Dietz Method does not discount delinquent loans in your portfolio – a loss is only accounted for when a loan is charged off. 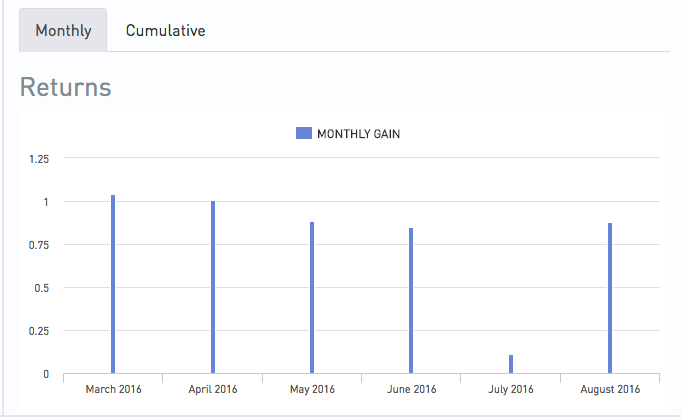 To calculate your Modified Dietz Return, we divide the gain or loss in value, net of withdrawals out of the account, by the average capital over the period of measurement. This performance measurement is recognized by the Investment Performance Council under their Global Investment Performance Standards (GIPS). You can find this return on your Dashboard. 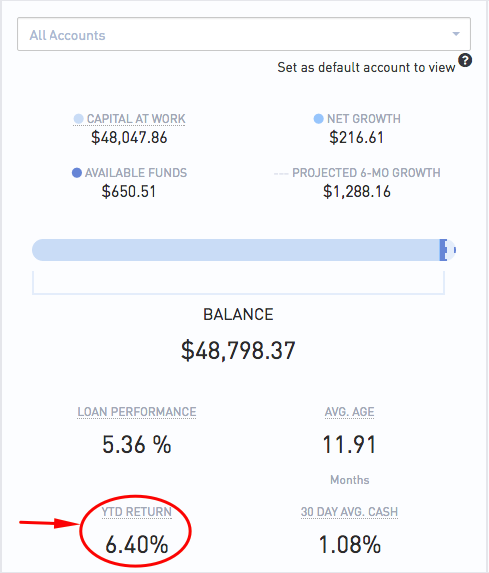 It is important to note that this return cannot be calculated retroactively – meaning, this metric reflects performance only as of the date you linked your account to the NSR Platform. As shown below, the “YTD Return” is a Dietz Method calculation in addition to the monthly returns chart. Utilizing both return calculations, investors can have a better picture of their actual account performance. Why not combine the returns calculations? We would love to! However, as some of our supported marketplaces do not yet provide data feeds to us with transaction history for funds transfers, it is not yet possible to provide one comprehensive number. Why are one or more of my return calculations extremely high or low? This most commonly occurs if you have sold notes on the secondary market. As we are not able to obtain detailed transaction history from all marketplaces, sold notes are removed from your portfolio, but the prior performance of the note and the markup/discount the note was sold for are not included. For the Dietz calculation, it can also occur if your deposit/withdrawal history is missing a transaction(s). Check your transfer log to confirm that all deposits/withdrawals reflected in your marketplace account are properly recorded. From your Account Manager, click the “Balances” button to see and modify the bank account transfers registered for your account. How are your return calculations different from the returns displayed at marketplaces such as Lending Club or Prosper? Lending Club’s Adjusted Net Annualized Return calculation is now fairly similar to the way that NSR calculates Loan Performance. Both calculations factor in principal, interest, service fees, late loan status, late fees, recoveries, and other adjustments. However, typically our return calculation is slightly more conservative than Lending Club’s ANAR – in our experience about 0.2-0.7% lower. The difference is a reflection of our more precise way of estimating losses on late loans. We determine late status in 30-day groupings, however, Lending Club groups together loans that are 31-120 days late into one status with a more optimistic loss estimate. You can read more about Lending Club’s return calculations here. Prosper’s return calculation is similar to our Modified Dietz Method calculation since it only factors in cash flows, but does not discount late loans until they are charged off. As a result, this return number is not going to be as meaningful on its own – especially for newer accounts.